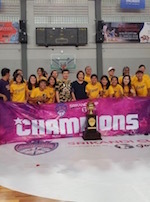 Merpati Bali keep the top of the Srikandi Cup 2018-2019 as they celebrated the 9th win. Last night Merpati Bali edged GMC Cirebon 68-46. They pulled a 12-8 lead and led 9 points at the halftime. The third period was decisive in the game as Merpati Bali produced a 22-6 surge to seal the victory. Fitria Ramadhani top-scored for the winners with 21 points and Husna Aulia nailed 8. Chinese women's basketball team swept host Indonesia 141-37 in one of the quarterfinal matches of 2018 Asian Games here on Sunday to set up a semifinal clash against Japan next Thursday. In this lopsided game, China took a lead of 31-2 in seven minutes, and widen the gap to 104 points in the end. Liu Jiacen explained that the whole team were well-prepared before the match, and the atmosphere in the stadium have deeply impressed her. "The victory has really boosted our spirit, though we have defeated Japan in preliminary round, they are tough opponents," said team captain Ting Shao (183-F-89). The other semifinalists in women's basketball at Asiad are Chinese Taipei and the Unified Korean team.